Whether in polytunnel beds or in containers, planting some spring bulbs in the autumn can be a good idea. Not only will they create a pretty display of spring flowers for you to enjoy, but they will also provide a valuable food source for pollinators out and about early next year. When choosing spring bulbs from a garden centre or plant nursery, it is important to select carefully to make sure you get healthy flowers in the spring. Check all the bulbs you select carefully for any signs of rot or disease. Choose only bulbs which are large, fat and firm to the touch. When it comes to spring bulbs, you will always get the best results if you choose the optimal time for planting. 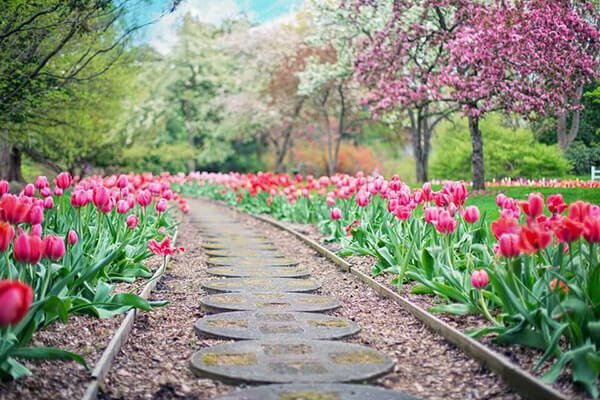 While the optimal time for planting will depend, to a degree, on where you live and the weather conditions in a given year, there are general rules of thumb for when best to plant different spring flowering bulbs in the UK. For example, October is the best time to plant daffodil bulbs, while November is best for tulips. Whether you are sowing your bulbs in polytunnel beds, or in containers, good drainage is essential. Be sure to incorporate plenty of good organic matter and, if you have heavy, clay soil where you live, it may also be a good idea to dig in some horticultural grit. If you are planting in pots, be sure to place plenty of crocks in the bottom of these containers before planting the bulbs. Spring bulbs will do best if you place them the right way up and to the right depth. If in doubt about which side is the top, place bulbs on their sides. As a general rule of thumb, it is best to plant spring bulbs to around three times their depth. Especially if you are growing bulbs directly in raised beds or in the soil in your polytunnel, it is important to make sure that you mark their positions, so you do not forget where exactly you have planted them. You don’t want to accidentally plant or sow something else in the same spot, or disturb the bulbs before they have a chance to grow. Make your own plant labels using natural materials, or household waste from your home. Spring bulbs may not be edible, but they may still be valuable and useful additions to your polytunnel. Spring flowers in or near your polytunnel will help to attract pollinators early in the year, and so as well as looking pretty, can also help you achieve your goal of growing food and eating from your polytunnel all year round. When and where do you plant your spring bulbs? Do you have any tips to share? Feel free to share your thoughts in the comments below.